One of the promises of the emerging sharing or platform economy is that it could make neighborhoods more resilient: Platforms can provide new economic opportunities for citizens; contribute to social capital formation; empower citizens in democratic processes; and they could play a role in a more efficient management of resources and overall sustainability. At the same time critics have pointed out that platforms could also undermine some of these aspects: they could induce a precarization of labour, lead to social exclusion based on cultural capital, cause social fragmentation, or increase rather than decrease the use of resources. In this workshop we want to further discuss / explore the relations between the rise of a platform economy in relation to the organization of resilient (social inclusive, sustainable) neighborhoods. What contexts, policies, design principles and governance models of digital platforms could contribute to more resilient neighborhoods? In particular, we would want to shift the debate from a focus on the major international platforms such as Airbnb and Uber, and explore the opportunities for locally organized platforms in relation to resilient neighborhoods. Prof. dr. Koen Frenken (Professor Innovation Studies Utrecht University) What’s at stake: A fair share : Safeguarding public interests in the sharing and gig economy. Strax – by Space & Matter – Strax is a neighborhood platform developed by architecture firm Space & Matter. Allowing future residents of a neighborhood to share communal resources, this platform is to make resource use more efficient, increase social capital and economic opportunities, lower building costs and produce an overall higher quality of life. Commonfare – Commonfare, or “welfare of the common” is a participatory form of welfare provision based on collaboration among people living in Europe that want to develop new ways of collectively responding to the everyday problems they face, improving their own lives. Platform Coops – Platform Cooperativism proposes an alternative ownership and governance structure for (local) platforms, that promises to empower users, producers, and local communities. what are the aims of local initiatives for local communities and what are the aims of local communities with local initiatives? what are the specific problems of developing local initiatives — such as privacy and securing interests of users — and how are these problems handled? what tools are available for local initiatives — in terms of organizational structures, ownership forms, platform designs — and how are such tools used in practice? The speakers and the organizers of the workshop were Dr. Martijn de Waal, professor (lector) at Play & Civic Media Lectoraat at Amsterdam University of Applied Sciences, Dr. Christian Frankel, associate professor at Copenhagen Business School; Prof. dr. Koen Frenken, a professor of Innovation Studies at Utrecht University and Martijn Arets, a researcher in the field of the platform economy. 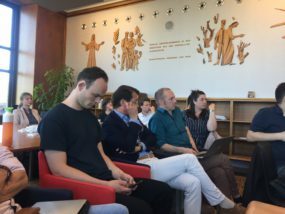 The workshop consisted of the introduction to the ideas and concepts concerning the sharing economy, a discussion about public and private interests within the gig economy and three significant case studies that were discussed in smaller groups. The first case study was about Strax– a neighborhood platform that allowed future residents of a neighborhood to share communal resources. The second case study revolved around Commonfare-the “welfare of the common”: a participatory form of welfare provision based on collaboration among people living in Europe; the third case related to the idea of Platform Cooperativism, which proposed an alternative ownership and governance structure for local platforms. 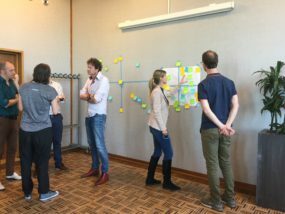 Moreover, several distinct themes became apparent throughout the conversation, these themes covered important aspects of the sharing economy and included the answers and suggestions regarding the three major questions posed at the beginning of the workshop. Both introductions to the key concepts and ideas, case studies and essential themes that came up throughout the workshop will be examined further in this report. In his opening talk, Christian Frankel, put the notion of sharing in a broader historical context, and zoomed in on three different interpretations of ‘sharing’ that are present in the current debate around the sharing economy. The basic definition of our current day sharing economy or collaborative consumption (Botsman and Rogers, 2010), also known as on-demand and gig economy regards ‘the peer-to-peer-based activity of obtaining, giving, or sharing the access to goods (open source software) and services (ride sharing), coordinated through online services’ (Hamari, Sjöklint and Ukkonen, 2016). According to Christian Frankel, as such it is related to the broader concept of economy that originated 2500 years ago from the word ‘oikos’, the house’ (Tribe, 2015); in the modern context, we may say it is the art of sharing in a household. In the Middle Ages — economy came to be about the larger household of the ruler and later of the state, and today we have a notion of the economy much concerned with private property, a monetary exchange under the exclusion of others. Throughout this story, many objects have been shared — within and between households. Examples that come to mind are cooperatives for agricultural machinery, cooperative diaries and ploughs. Sharing itself can mean various things. Etymologically, sharing stems from ‘shears’ (also known as ‘scissors’); in this case ‘to share’ means to cut or divide. However, the idea of sharing also has other meanings; as a result, ‘sharing’ in general and the ‘sharing economy’ in particular become the concepts that are complex to describe. It is possible to share a computer or hammer: in this case sharing is about the collective usage of an item. However, scaled distribution of, for instance, files or emails can also be recognized as sharing; as well as having similar passions, which can be characterized as sharing interests. Examining ‘Conceptual boundaries of sharing’, Jenny Kennedy unfolds three meanings of sharing in the history of networking culture since the ARPA days. (Kennedy 2016). Sharing as an economy: An example is the sharing of hardware — expensive mainframe computers — that many scientist could use, such as timesharing. Other examples are sharing a car or a hammer or some other tool. Sharing as a mode of scaled distribution: Here sharing refers to the distribution of content, such as file sharing. In the case of the ARPAnet it did not take long before sending emails back and forth used a considerable part of the computing capacity. Sharing as a site of social intensification: Here what is shared is for example interests, such as by making lists of what ARPA researchers had what research interests. These three notions of ‘sharing’ were present in the early days of networking culture (Kennedy, 2016) and remain present in current sharing economy initiatives. Thus it seems that ‘sharing’, in several senses of the word, come together, and when for example talking of neighbourhood resilience, it is often hoped that ‘sharing in one sense’ also produces sharing in some other sense. For example that ‘sharing hardware’ also creates social intensification and community. Sometimes this hope or expectation comes from confusion. From confusing the different ways in which ‘we share’. It is precisely the confluence of these meanings in today’s definition of sharing economy that brings out tensions and confusions. The sharing of resources could contribute to a sense of shared community or identity, but is could also produce conflicts about the use of shared resources. The other way around: a shared identity could increase the willingness or provide a basic trust needed to engage in the sharing of resources. Yet that same mechanism could also lead to practices of exclusion. Both aspects are important to take into account when relating sharing economies to local neighborhood resilience. It is probably also a question of craft and experience to make ‘sharing of hardware’ into ‘shared understanding’ or even ‘shared goals’. The study of local sharing economy initiatives is a way to learn and better understand how this can be done. In the second talk, Koen Frenkel further elaborated on the idea of sharing economy and the emergence of digital platforms that enabled the sharing of items and services not only among individuals knowing each other, as it used to be before the emergence of the Internet, but among strangers. The dimension of trust has become more important, with platforms introducing reviews and rankings of different users and of their activity on the platform. In terms of the impact of such platforms, the economic effect is positive, as they cause lower transaction costs and more employment opportunities, especially with platforms such as Taskrabbit and ride-sharing platforms. However, the introduction and growth of sharing economies platform have significant repercussions: platforms can be exclusive and result in inequality. For instance, with apartment sharing, only individuals who are well-off can rent out apartments using platforms such as Airbnb. When considering social and environmental factors, the influence on the planet is two-sided. Sharing a resource such as a car is more productive in this regard than everyone buying their own car, on the other hand: if it becomes easier to use a shared car, this may lead to an increase of mobility. This shows that with the development of sharing economies platforms certain public interests are at stake, including tax compliance, consumer, labor and privacy protection; not to mention that many platforms undermine existing laws and regulations. Part of the discussion is related to conflicting institutional logics that are at the heart of the organization of economic activities through platforms. Referring to Thornton et al., Franken gave an overview of various institutional logics through which historically economic, social and cultural activities were organized: the family, community, religion, the state, the market, profession and corporation. Whereas the logic of the corporation matched well with that of the market, and the state has found instruments to regulate these from a public interest perspective, with platform new tensions between institutional logics arise. In a professional-market-corporation-state logic, the economy is characterised by relatively few producers and many users. A shift to a platform economy increases the number of producers, and this leads to various tensions. First, between the corporate logic of the platform provider (e.g. Uber as a company) that wants to maximize its profit, and the logic of the service providers (e.g. the Uber driver) that want to maximize their income. Not only do platform providers take a cut, it is in their interest to keep tarifs low in order to remain competitive. Second, a tension arises between professional forms of organization and service providers. In a professional logic, groups of professionals set standards that members have to comply with, these can be professional norms, such as those journalists follow, or particular certificates and regulations that members need to comply with, such as ‘The Knowledge’ that London cab drivers need to master before being able to enter the business. This mode of organization is to guarantee particular standards and public values, at the same time can become a practice of exclusion to keep outsiders out of a particular profession. Platforms open up this playing field, introducing new mechanisms for quality measurement such as reputation systems. Last a tension emerges between state and platforms with regard to regulatory mechanisms. Platforms demand all sorts of exemptions, as they do not see themselves as being part of for instance the transportation sector, claiming that they are mere connectors. In turn, Frenken concludes, Platforms may grow into a new kind of institution, with its own logic. Yet, how to tune this logic with existing institutional arrangements, and safeguard public values in the platform logic is a question that is still open to debate. 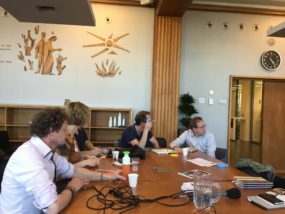 Koen Frenkel introduced several scenarios concerning the further development of sharing economy in relation to various institutional logics. Platforms could become more like corporational actors that have to employ their workers; in another scenario public platforms might develop that could be run by a local community or professionals in a certain field. New governance models may occur at the level of the state. Yet, it is difficult to predict what is likely to occur in the future, as, it remains unknown which regulations will be implemented, and if the platforms themselves could affect the laws, as it happened in the case of Uber. Again, for an understanding of the role of sharing platforms in relation to neighborhood resilience it is important to take these institutional logics and their inherent conflicts into account. In this section of the report, the major themes that occurred during the discussion at the workshop will be introduced and examined. Some of those themes were talked over during the introductory part of the workshop, while others came up during analyzing the topics on the subject of case studies, mentioned in the introduction section above. The first theme that appeared as a result of a discussion is the economic impact of sharing economy platforms. As mentioned earlier, generally speaking, sharing economy provides individuals and with a multitude of employment opportunities and allows them to have a flexible working schedule, have additional sources of income and stay employed regardless of their education or working experience. For instance, individuals can work as freelancers, engage in work on platforms such as Taskrabit aside from their regular jobs, and sell or rent out goods at the online marketplaces platforms. It is crucial to mention that sharing economies platforms also allow individuals to have a day-to-day income without an official job contract and such platforms contribute to the division between employment and unemployment becoming less visible. Notwithstanding, individuals who use platforms such as Lyft as their main source of income are also facing certain shortcoming of such platforms in terms of benefits and opportunities they get as employees. For example, many platforms such as Uber do not consider individuals working there as official employees, therefore, they are deprived of benefits such as insurance, guaranteed vacation days, pensions and having to work only certain number of hours every day. Not to mention the fact that the employee protection rules are not always implemented, and individuals are not guaranteed safety in the workplace, as well as freedom from discrimination. Owing to the growth of sharing economies platforms, more and more representatives of different social groups and classes are choosing to participate in the sharing economy, thus agreeing to work in the conditions that do not provide them with long-term security and stable income. It is worth stating that sharing economies platforms do not necessarily have a commercial business model, and certain peer-to-peer initiatives, such as Couchsurfing and more local ones, including bicycle-sharing platforms. However, the majority of them still have a business component, as it is more challenging to sustain the platform otherwise. The main discussion point that was regarding the question to what extent do these new modes of the economic organization contribute to neighborhood resilience? In the short run, it seems platforms may enable citizens to overcome periods of hardship, as it makes the division between being employed and unemployed less clear: one can always find a job or sell some goods or services through a platform. For individuals, this creates a way out of dire situations or provides economic opportunity in general. However on a collective level and long-term perspective such a system undermines collective labour agreements, such as pensions, protection of free time, working hours and living wages, and thus erode the resilience that is built into these society-wide institutional logic of the welfare state. Many platforms have a primary goal of creating a community and building as well as maintaining social ties among the members of this community. When reviewing this theme, it is useful to pay attention to the cases present during the workshop: Strax and Commonfare. As mentioned in the introduction section, Strax is a neighborhood platform that aims to facilitate sharing and increase access to common resources for the future residents of a neighborhood. The question that arises here is what kind of social capital can be created using such platforms, what social capital is needed and recognized and what is that relation between social capital and geographically bounded areas? The underlying issue is whether the platform can be successful because they enable a ‘trustless trust’ and ‘stranger sharing’ because of their reputation mechanisms and other features. This may stimulate local transactions to take place, but does it also build social capital? Can a community arise from such trustless trust, or is it the other way around, and does it undermine the need for local trust systems built up through the institutional logic of the community; turning a local community into a more impersonal ‘collective’ arrangement: connecting individuals based on single interests? Or is it perhaps the other way around? Does a local platform need an existing community, with multiple social relations between members? Furthermore, to what extent does such a common understanding based on social and cultural capital also work as a mechanism of exclusion? This dynamic was discussed in relation to the Strax case study. How to encourage the collective members to constantly work together, while maintaining social ties including, for example, older members of the community taking care of children while their parents are at work? The challenge is to make an individual interest a collective interest. Think about cases such as neighbors moving out of the community: what consequences will occur in this case and how will it change the dynamic within a collective? It is worth stating that even though Strax aims to create a self-regulating community, some rules should be implemented to create better conditions for a collective and facilitate building social capital. While there is no hierarchy, those rules can be encoded into the platform itself. Furthermore, when talking about the platform and its design, it is significant to consider the idea of reputation systems. Can individuals be ranked based on their contribution to the collective? Can this encourage more members of the community to follow the rules and maintain positive relationships based on helping each other and reciprocity? If so, what kind of reputation system should be created? Moreover, since Strax aims to focus on social rather than economic capital, what could the reward system look like, and what kind of transactions ought to take place? Additionally, are there other ways of introducing reputation systems, for example, the representation of ‘collective reputation’ in the form of narratives? The debate regarding social capital can also be applied to the case about Commonfare project. The aim of the project ‘is to foster commonfare, or ‘welfare of the common’, which is a participatory form of welfare provision based on collaboration among people living in Europe that want to develop new ways of collectively responding to the everyday problems they face, improving their own live’ (Commonfare, 2018). Commonfare project aims to build social capital and facilitate the collective identity among individuals, and in this case it still remains unclear about how exactly to motivate more and more individuals to be directly involved on a regular basis. As mentioned in the previous sections of the report, creating and maintaining both economic and social capital is crucial for most sharing economics platforms. Even though economic capital is important for the commercial platforms, there are platforms such as Strax, where building social capital in a neighborhood is also an important goal. However, it is complex to encourage individuals to engage in the social transactions on the platform without providing them with any kind of a reward. This may lead to a ‘community paradox’: in order to stimulate participation, all contributions can be measured and rewarded with micro-credits in a local exchange system. However, in itself such an economization of acts of friendship or neighborliness, and the formalization of these informal practices, may in the end undermine that very neighborliness. There are chances that residents will increasingly see each other as impersonal economic actors active in an exchange market of micro-services, and less as neighborhood or fellow citizens. Does the economization of social transactions in the end contribute to social capital or does it undermine it, turning us into economic actors rather than neighbors? The last theme deals with the issue of ownership and governance of platforms. Who sets the rules and conditions for interaction? How can local residents have a say in the platforms that govern their everyday activities? When reviewing this theme, the main focus was the Platform Cooperatives case. Platform cooperatives are cooperatively owned businesses, that have an alternative, more democratic governance model. An example of such a cooperative is Fairbnb, which is a “coalition effort that brings together groups from the regulated hotel and B&B industry with property owners” (Fairbnb, 2016), that exists as an alternative to the Airbnb, a commercial platform that causes significant negative effect on the neighborhoods and urban infrastructure of different cities. Another example is Eten.com, a cooperative that emerged as an alternative to Thuisbezorgd.nl. In various cities across the world, taxi drivers have also introduced their own collectively owned platforms as an alternative to centralist Uber. The significant characteristic of the platform cooperatives is the idea of the involvement of different stakeholders in the governance of the platform and avoiding exclusivity in decision-making. Even if the majority involved in the governance have a low equity stake, they still have an opportunity to participate in the decision-making on the platform. Not to mention the fact that cooperatives aim to solve issues such as unfairness and privacy problems by introducing aspects such as privacy, inclusiveness, and data protection. After developing sustainable governance models, cooperatives also aspire to achieve replicability of their ideas for other platforms to ensure that the effective principles they have come up with can be further used by other cooperatives. However, does this all mean that cooperatives are a direct path towards less exclusivity and increasing value creation? Generally speaking, the answer is yes, but cooperatives require resources in the first place, as it is expensive and complex to build well-functioning attractive platforms. Besides, not every individual wants to be part of a cooperative governance system for every aspect of their daily life; many individuals want to have a voice, a say about the organization of the system, but not necessarily a part of the whole governance process. The discussion about the precarity and security of jobs within the sharing economy took place in the context of the Commonfare case. As mentioned previously, sharing economies platforms offer individuals a diversity of job opportunities. However, these types of jobs are not always secure, as they do not provide employees with long-term contract and benefits such as pensions or health insurance. Therefore, they can be characterized as examples of precarious employment. However, if talking about the secure jobs within sharing economy, it is intrinsic to define what is meant by security. Is the idea of an individual having a stable job in the same organization for a number of years considered security in the modern world? Can a more flexible job, even though it does not provide pension benefits, can also be considered as secure? For instance, if an individual’s lifestyle or certain conditions do not allow them to work a traditional 9 to 5 job, however, the job the platform provides them with can be a source of additional income, would not that be considered as some form of financial security? This debate should also take into account the general numbers of people who are employed on the sharing economy platforms. If the majority of populations is working as freelancers, the outcome will be different, then if individuals engage in sharing economies, while still having their main job. It is also crucial to mention the fact not all individuals involved sharing economies pay sufficient taxes, which, in turn, can lead to the larger negative effect on the economy of the whole country. Not to mention the fact that it remains unknown about what happens if the larger percentage of individuals will not be getting pensions when they are older. While the previous theme discussed a more global aspect of the sharing economy, it also important to focus on the issues that might emerge within the smaller community or neighborhood. Such issues could regard inclusion and exclusion, who gets to use the platform and who has more influence when using it. Reputation systems, while important to provide individuals with some form of rules and motivation, can result in certain individuals having fewer rights or opportunities on the platform. Could certain interests, competencies, calculations, or responsibilities prevent individuals from joining the platform or, on the contrary, increase the likelihood of them becoming active users? By analyzing what it takes to become included in the platform — and who gets excluded — we can get an understanding of the type of community emerging through the platform. However, it is complex to come to a final decision about how to prevent exclusiveness of the platforms and make them equally accessible for any individual in the neighborhood as well as motivate individuals to participate in those platforms. The workshop on Sharing Economies and Resilient Neighborhoods discussed a variety of positive and negative aspects of sharing economies platforms, both on a larger international scale and in a local setting. Both commercial platforms and platforms which do not include the financial transactions were taken into account. The purpose of the workshop was to understand better how more local sharing economies can build sustainable governance models and benefit individuals living in the neighborhoods, gaining insights into relevant research questions and issues for further research. One important theme / research question is: How do neighbourhood platforms do communities? This general question is to be discussed with a focus on inclusion and exclusion. In doing so, we are not so much interested in articulating our own normative perspective — such stating ideal criteria of inclusion — but rather as a diagnostic distinction to understand how platforms do communities. By analyzing what it takes to become included in the platform — and who and what gets excluded) — we can get an understanding of the type of community (or collective) emerging through the platform. The question of inclusion and exclusion is thus a question of ‘inside’ and ‘outside’. Inclusion and exclusion can be analyzed more specifically in relation to roles, tools and time-perspectives. Roles — concerns what character actors can have in association with the platform. A role can be characterized for example in terms of what types of interests, competencies, calculations, responsibilities actors are equipped with and afforded with by entering into the platform. Tools — concerns the particular means of presentation, representation, association and more than a platform offers. An example is a system of reputation: in what ways does the tool allow to evaluate and what is excluded by such tools? Time-perspectives, wishes and expectations — concerns what types of ideas or perspectives on the future are afforded by the platform. Are such wishes and expectations framed in terms of (increasing, decreasing) resources of specific kinds, in terms of collective activities (neighbourhood festivals), in terms of larger problems and ideals (such as climate change, aims for developing the neighbourhood) or something else? Why do they take part? In what ways do they take part? What would they like to see different? How can they voice concerns and interests and how would they want to be able to voice? What does it bring for communities, for the individual and for society at large? And what is excluded in bringing this? Saybrook, CT : Tantor Media. Commonfare (2018). Our goals. Retrieved from http://pieproject.eu/. Fairbnb (2016). About Fairbnb.ca. Retrieved from http://fairbnb.ca/about/. Hamari, J., M. Sjöklint and A. Ukkonen (2016). The Sharing Economy. Why people participate in Collaborative Consumption. Journal of the Association for Information Science and Technology 67(9), 2047-2059. DOI: 10.1002/asi.23552. Kennedy, J. (2016): “Conceptual boundaries of sharing” Information Communication and Society Vol. 19, S. 461–474. Tribe, K. (2015). The economy of the word. Oxford: Oxford University Press.